Search Console is another very useful tool for improving your local SEO. Combined with Google Analytics, Google Search Console can enhance your efforts to be found on the internet. Whereas Google Analytics provides you with information on what visitors did on your site, Google Search Console helps you to understand how easy or difficult it is to find your site. This makes Google Search Console an essential tool for strengthening your site’s SEO – maintaining your site’s presence in Google search results. Just like Google Analytics, it is a free tool that can inform you of any errors on your site, any links pointing back to your site, and perhaps most importantly, information on your most popular keywords. We use it to help define the progress of all our customer sites. The opening screen that presents when we first open the Search Console is the dashboard. The dashboard is useful as a quick check into the overall health of your website. The first section will tell us if there are any crawl errors associated with your site. The green checks – in this example – indicate that all is OK. When we click on the double arrows after the words “Search Analytics”, we are taken to the Search Analytics detail screen, which indicates how many clicks your site has received within the past 30 days. Not many clicks? Then we need to research further and find out what’s going on. This particular screen is the one we use most. The date range of the report defaults to the previous 30 days. 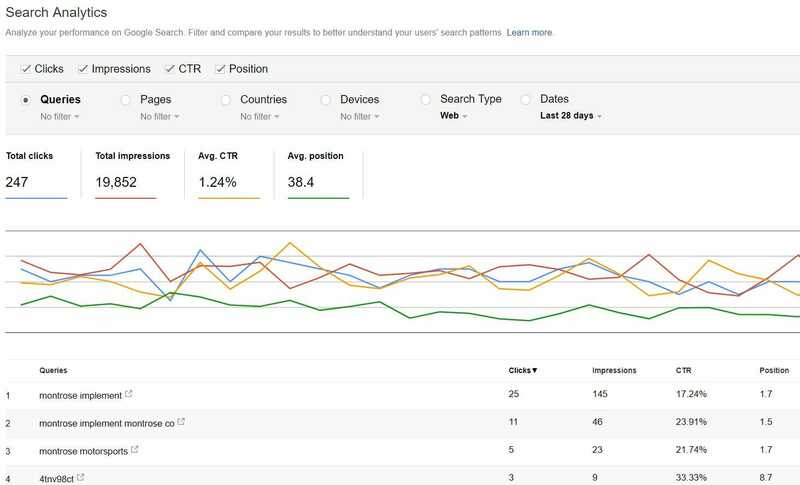 We generally click on all four data points: clicks, impressions, CTR (click-through-rate), and position. Underneath the graph is a list of search queries that your site is showing up for. We check this list for the keywords we expect your site to be ranking for. If they are not showing up on the list, we consider whether your site has enough relevant content for that particular query. And if not, then we need to create more content for you on that topic. It’s also useful to look for queries with high impressions but low CTR. Again, this may point to content deficiency. One note of caution: some of the queries with high impressions will be within a national arena (rather than local), and thus are difficult to rank for. So it’s quite likely that your position will not be very high. One of the more powerful tool within Search Console is the ability to verify whether your site’s pages have been indexed by Google. The Sitemaps page shows this information, so it’s a good place to visit periodically. In this particular case we see that of the 80 pages submitted for indexing, Google has indexed 76 of them. If these two numbers diverge, it means there is a problem, and we need to solve it. The HTML Improvements page gives us an overview about any on-page HTML issues that are affecting your site’s page rank. In this particular example, we see that there is one area of concern that Google has found for this website: duplicate title tags. Each page or post should have a unique title tag, much the same way that books have different chapter headings. After seeing this, we know we need to dig into the back end of the site and reassign unique title tags to all the relevant pages.